There were 4 posts published in October 2015 (this is page 1 of 2). Learning a new framework or language always feels slow and sluggish at first. I’m working on learning Ruby on Rails right know after a year or two of not learning a new framework and I had also forgotten the feeling. At first, I stumbled at every step on the way and nothing was familiar even if I’ve been programming for the web for many years. Not to help things, Rails is a strongly opinionated framework, so a lot of things are done by convention and not by configuration or by code. It’s a great productivity boost once you know the proper conventions, but it’s hard to deduce all of them at once when getting started. At first, I had the impression that I was going slower than usual. For a developer with a good grasp of the web and of other frameworks, a few weeks should be enough to get up to speed in a related technology and reach a point where they’ll be able to produce work at a decent pace. Not top cruising speed, but a few months down the line nobody will notice that they were new at it. If you’re learning as part of your job as a full-time developer, you’ll have about 30 hours a week to get up to speed if you don’t have any other task to work on. This number gives you some padding for a few meetings and unforeseen emergencies. If you learn by yourself using online resources, 3 weeks is a reasonable time frame to learn a new framework you’re not familiar with, so 90 hours are needed. Let’s round it up to 100 hours. If you’re learning on you own and have a busy life, you’ll have time to work on it maybe 1 to 2 hours a day for a total of 5 days a week because you’ll most likely be busy a few nights a week. So 5 to 10 hours a week would be a realistic estimate. If learning that same skill takes 100 hours, you’re looking at 10 weeks to 20 weeks to do the same job. So, in the end, it’ll probably take you 3 months at the very least, and probably something like 6 months if you’re too busy. These times are not strictly equivalent, but should end up being about the same: if all your learning is concentrated in a short time frame, you’ll loose less time to context switches. It’ll be faster to get set up and remember what you were doing if you’re working on it all the time, and you’ll need switching less often for the same result if you’re working a full day on it. On the other hand, when you have to stretch it out, you’ll have more time to for new knowledge to sink in between sessions as long as you build the habit of doing it regularly. It’ll take longer to reach the same result for sure, but you’ll reach the same point eventually. You’ll still be working as a software developer in 6 months: this time will pass anyway, so if you start investing some time now you’ll have a brand new skill down the line. So don’t be too hard on yourself if you feel that learning something is taking you forever: you’re not too slow, you just have to put in the time to get better at it. 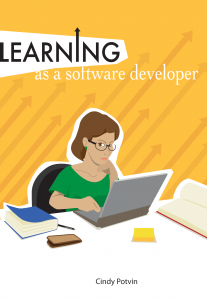 Highly productive developers have a deep understanding of their specialization and are incredibly focused. They are rarely confused: they know what’s going on in their project and can find the source of a problem in a flash. They are also skilled in a variety of other subjects and can discuss the relative merits of other technologies with ease. How can you become this way and be productive in your own work? If you want this kind of skills, you must plan to develop your knowledge in a way that allows you to be T-shaped. Put simply, a T-shaped programmer has strong core knowledge in a domain that grounds them and allows them to be effective, which is the base of the T, and other skills in a wide variety of subjects, which is the bar of the T.
I first heard of the concept of being T-shaped in an article about success (http://www.artofmanliness.com/2013/04/09/to-succeed-in-work-and-life-be-mr-t/) on the the Art of Manliness blog. This is how I’m structuring my own growth, so I was glad to be able to put a name onto it. I also believe this is the most efficient way to develop your skills. Being T-shaped is not something that you’ll achieve in a year or two: rather, this is a lifelong pursuit of growth. This is also a good way to invest in your future: if you only have superficial knowledge of many code bases and frameworks, you’re always starting over again without building a strong base of skills. You have to go in depth in a at least one area: once you have a strong grounding, moving to new languages and frameworks will be faster and more effective since you’ll have a stronger understanding of programming itself to start with. For a web developer, what is a good plan you can follow to become T-shaped and ultimately become a more productive developer? In my experience, the following knowledge is required as a web programmer if you want to build a proper base for your T. When you’ll have those skills, you’ll be a strong web developer and you won’t fear missing out on new technologies and trends: you’ll have the evergreen knowledge that will allow you to learn new stuff faster. Understanding what happens at the HTTP level when you request a page or sends information, and how those requests are structured so you can debug a wide variety of problems and understand what’s going on in general. Styling your HTML with CSS to know how styles behaves and how they are applied to elements. Having strong knowledge in at least one programming language used to build web pages such as PHP, Ruby, C# or Python. Using debugging tools such as Firebug or the Chrome developer tools and the debugger for your language of choice to solve problems efficiently. Understanding how data is stored in a database and how to retrieve it or manipulate it using SQL queries. This is often abstracted in modern frameworks, but sooner or later you’ll need to look at the real data to debug. Sticking to good programming practices in commenting and structuring your code, and understanding how to manage your time efficiently while coding. Notice that I didn’t include any knowledge about frameworks, API or libraries in there: those change all the time, and you’ll pick them up easily if you base is strong. You can’t commit all the details of the APIs and libraries to your memory, but you can master them basic building blocks and use them to understand the APIs as needed. Once you filled up the base of the T, you can opt to develop knowledge in additional areas that will allow you to leverage your core skill more efficiently and add to your body of experience. Those skills don’t need to be directly relevant to your work: their role is to add more depth to your knowledge. You will fallback on those skills to fix bug or respond to demands that are normally outside your job description but that will allow you to grow. Anything that you’re curious about and that’s not directly linked to your daily routine is a good fit here. This is the time for dabbling and short-term experiments! You don’t need to see these two lists as a huge mountain to climb: they are there to give your ideas of what your skills may look like in many years if you’re aiming to master web development and be highly productive at it. You need to build your own unique plan depending on your goals as a developer so you can aim in the right direction even if technology keeps changing.